Civets have lithe bodies and long tails like a cat but the muzzle is extended and pointed like a weasel. Most species of civets have stripes, spots or bands on their bodies and their tails are often ringed with contrasting colours. 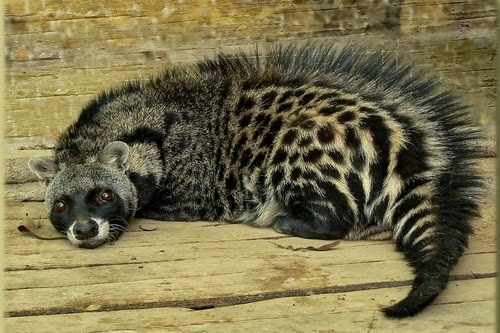 Civets are nocturnal creatures and and spend the day hidden in the bushes or asleep in the tree top. They live mainly in habitats located in woodlands, savanna, mountains and especially tropical rainforests. Civets are omnivorous and feed on small animals, vegetation and fruits. All civets have a gland producing pouch which secretes a substance called civet. It has a very strong musky odour and is traditionally used as a perfume fixative. The most popular species for this purpose is the Indian civet from South Asia. In the wild, civets use their musk to mark their territory. Hello there, we are welcome all kinds of thoughts-supportive, opposed, critical or otherwise but before you add comment please use English, Indonesian and Malay language. Thank You! Subscribe via RSS Feed If you enjoyed this article just click here, or subscribe to receive more great content just like it.